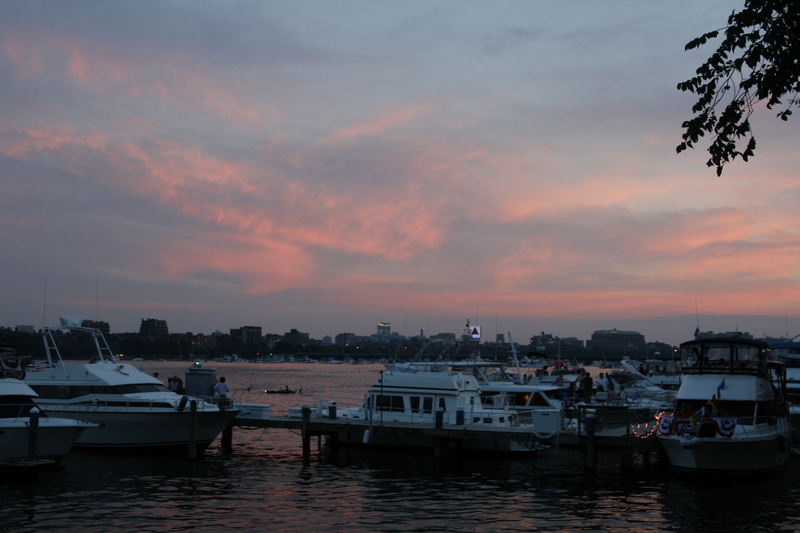 The sky was ablaze in Boston and Cambridge last night, with lightening bolts and cameras flashing while the moon rose. 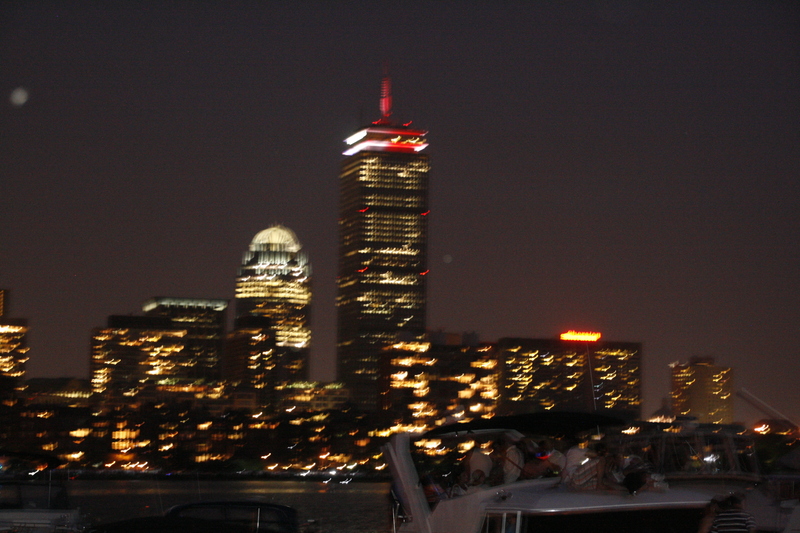 The late night sky was patriotic with the red shooting lights of flares, the red, white and blue lights on the Prudential Center, and fireworks appearing now and then above and beyond the Boston skyline. 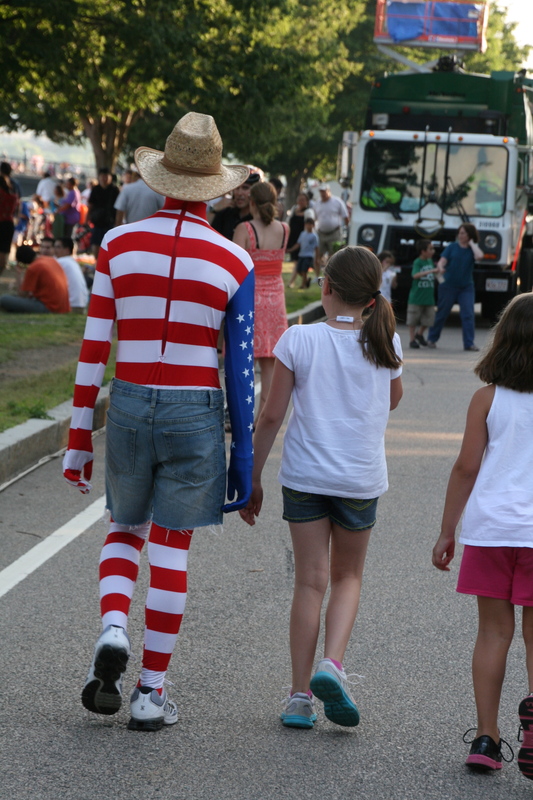 Although thunderstorms were predicted all day, my family decided to take our chances and head into Cambridge to see the fireworks and to listen to the Boston Pops. Equipped with folding chairs, a picnic, blankets, games and books, we arrived around 3 p.m. and staked our claim next to the railing along Memorial Drive. 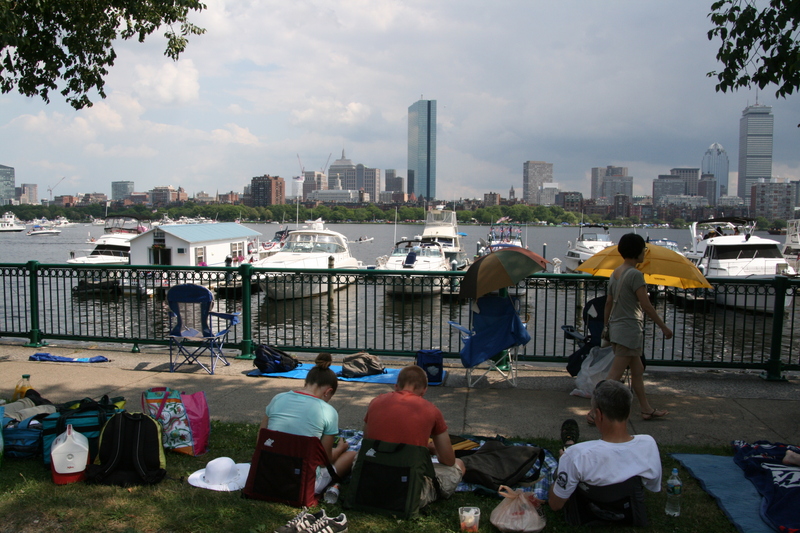 We were as close to the river as we could get without being on it and for the next several hours we hung out, chatting, people watching, meeting our 4th of July neighbors, playing games of Uno and Hearts. We read and ate and explored, amazed at all the state police and the people staking claim to bits of grass and pieces of sidewalk. It was hot and muggy. 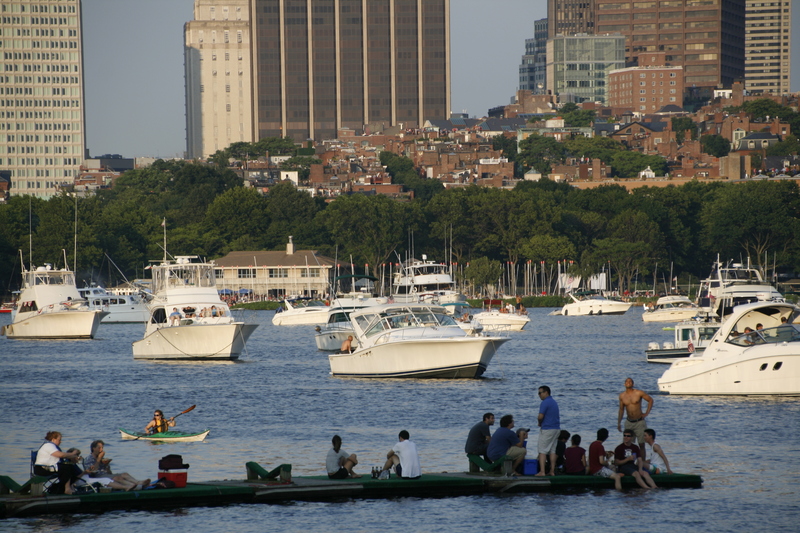 Kids jumped off boats into the water (yes, they swam in the Charles River! 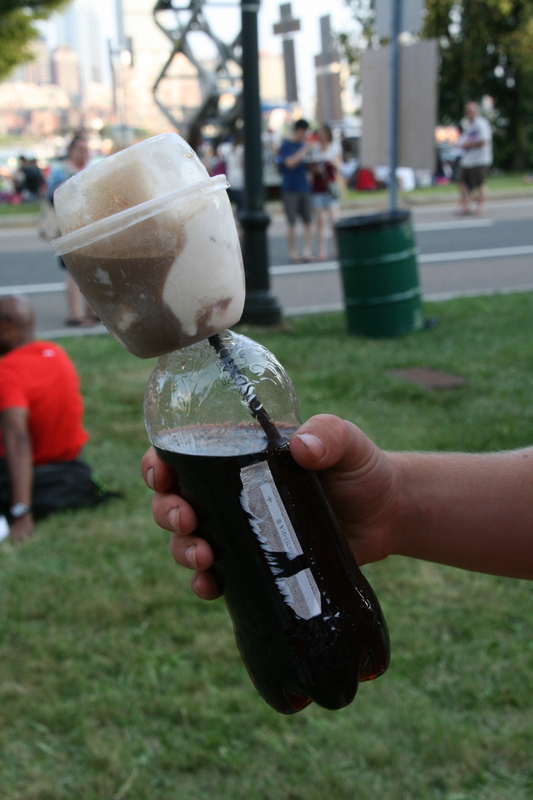 ), the event organizers allowed people to keep their tents up longer than usual (as late as 7:30 p.m.), and we bought root beer floats. At 8:20 p.m., the concert began as scheduled with the “Star Spangled Banner” performed by the U.S. Navy Sea Chanters. 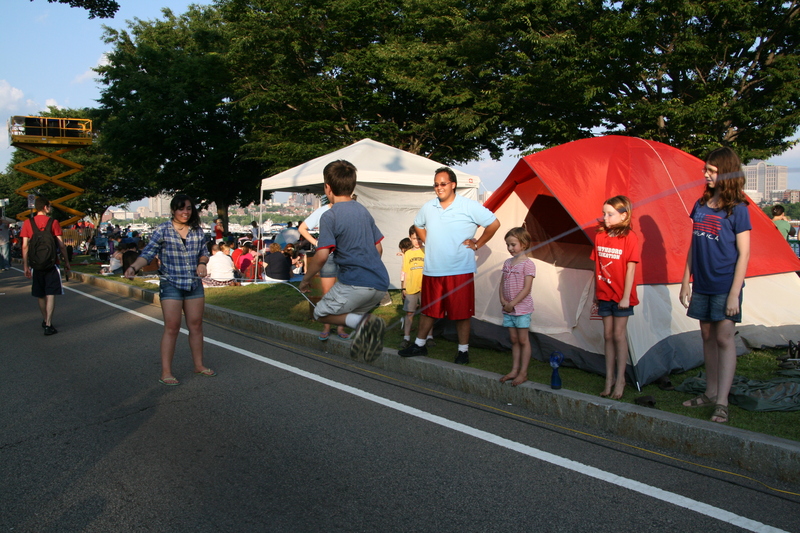 From speakers along Memorial Drive, we heard the Pops perform “Olympic Fanfare” and the themes from “E.T.” and “Raiders of the Lost Ark” as lightening brightened the Cambridge skyline. We listened to the Dropkick Murphys and Jennifer Hudson and to “Dancing Queen” by Mamma Mia vocalists, but we didn’t hear the “1812 Overture.” At 9:25 p.m., a public safety announcement asked us to take cover from the storm. Some did, but we didn’t, hoping the rain would never come. Thirty minutes later, the rain still hadn’t arrived and the bolts had subsided. The Pops began to play, “Stars and Stripes Forever,” the last scheduled song on the program. People pushed up behind us, everyone eager to get the best view of the anticipated fireworks. Jennifer Hudson sang another song, and the U.S. Navy Sea Chanters sang a few patriotic songs before the music stopped. After a long pause, both the fireworks and the rain began. We leaned against the railing, ooohing and aaahing the fireworks between rain drops, kaleidoscope designs of every color and shape, hearts and boxes and shooting stars, the bang of each blast competing with the 4th of July playlist. When the fireworks were over, my almost 16-year old son said the hours of waiting were worth it; we followed the masses to the T and back to our car. Our family has never braved the crowds in Boston for the fireworks. After reading about your experience, it seems much less overwhelming. Almost…do-able! 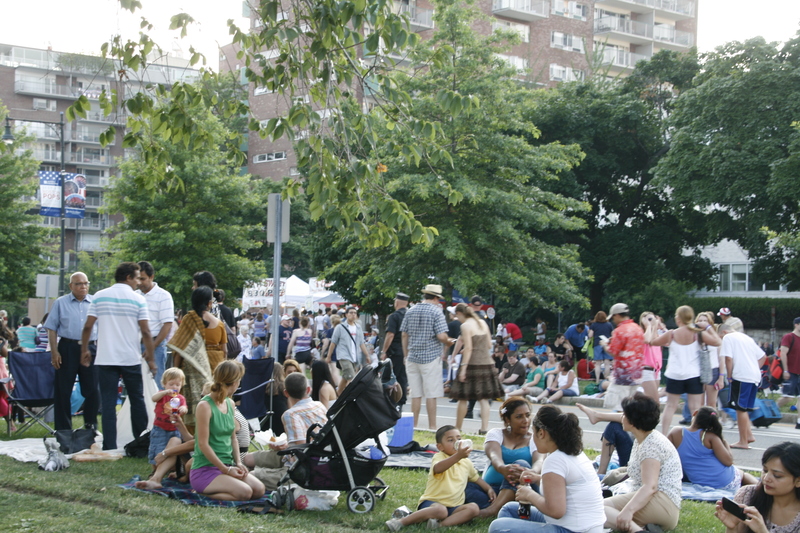 What a great way to take advantage of one of America’s best cities! It was better than I remembered or anticipated. There was so much energy! Great blog! Felt like I was there. I remember doing that back in, oh, about 1987 with my Navy boyfriend… gosh haven’t thought about that in years. Thanks for the memories!